Those of you who came along to the last Dialogue Community of Practice National Event will know that we have been working on creating an evidence base to encourage leaders with little or no knowledge or experience of working with Dialogue to integrate it into their personal models of leadership and organisational change. Our enthusiasm as dialogue practitioners is even more powerful when backed up by case studies and personal examples of where dialogue has contributed to profound change. We found some really interesting examples from the UK, and further afield, of dialogic methods being used to effect whole system change and have anecdotal evidence from local dialogue practitioners of the impact working with dialogue has made on their ways of leading and on how they view the world. However, we chose to focus on the form of Dialogue described by quantum physicist David Bohm in the book “On Dialogue” and developed by Williams Isaacs in his book “Dialogue and the Art of Thinking Together”. Isaacs describes Dialogue as ‘a conversation with a centre, not sides’. One source of successful case studies – describing aims, methods outcomes and learning – is Prison Dialogue. This charity has more than 20 years of experience of introducing dialogue into a wide range of situations across the Criminal Justice System. Fortunately, Peter Garrett and Jane Ball have written up their experiences working with whole prisons in the UK and state-wide prison systems in the US. Case studies can be found at: http://www.prisondialogue.org/research. More interesting case studies, in the use of dialogic methods for organisational change, are available from the consulting firm Dialogos – founded by Bill Isaacs. These are written as promotional tools but provide useful illustrations of how Dialogue has contributed to culture change, implementation of complex projects and turnaround of failing alliances. Visit http://dialogos.com/clients/case-studies/ for more information. Most of the academic sources I have uncovered stress the need for more research into the impact of dialogue on organisational change. 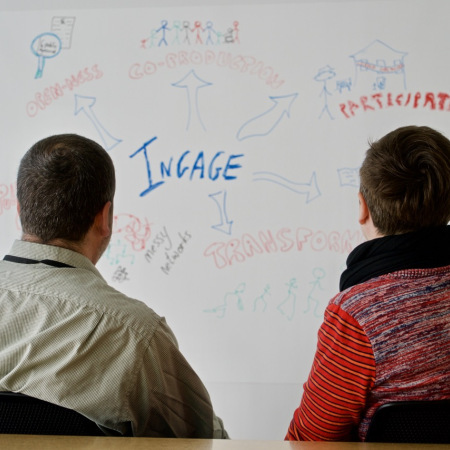 In Finland dialogue is being used in national programmes and local action research projects as a way of bringing about change – “organisations can be seen as public spaces where dialogue takes place”. The Finnish public sector has employed dialogue in workforce development and industrial relations as well as in areas of policy development. In Canada dialogue has underpinned the transformation of the financial payments system. These examples are written up by academics but there appears to be very little structured research. Here in Scotland dialogue is being used effectively for organisational change in pockets across the system. Apart from the Dialogue Community of Practice itself, we know of initiatives in NHS Greater Glasgow & Clyde, NHS Lothian and NHS Fife, for example. We would like to hear from anyone who is using dialogue effectively within their organisation and is willing to share their experiences with others or who would be willing to participate in a research programme to test dialogue’s effectiveness in different change scenarios.